The Kenny Barron Voicing is an open-sounding minor 11th voicing. The voicing gets its name from the acclaimed jazz pianist Kenny Barron. The voicings is made up of two perfect 5th intervals in each hand, separated by a minor 2nd interval in between. The perfect 5th intervals give the voicing it’s open, spacious sound and the minor second interval add a touch of tension and dissonance. Memorising this formula will allow you to build the chord in all 12 minor keys. 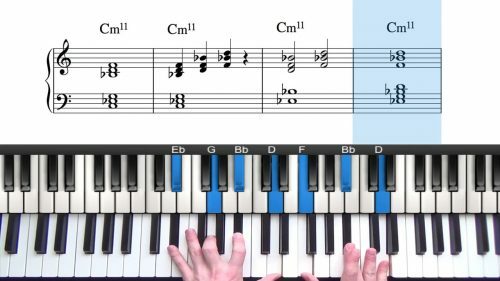 Notice that the top scale degree of the voicing is the 11th so when you’re reading lead sheets, look out for minor chords with the 11th in the melody. There are a number of different variations of the Kenny Barron voicing that can be used. The first variation is to double the 9th, by adding a triad at the top of the chord. In the key of D minor, this means adding a C major triad at the top of the chord. The second variation is to double both the 9th and the 11th of the chord. This creates a thick, meaty voicing and really brings out the 11th colour of the chord. We can double the 11th using the right hand thumb which now plays two notes. This isn’t possible in all keys but works in most. We can also change the quality of this voicing from minor to major simply by making the minor 2nd interval that separates the two hands into a major 2nd interval. We keep the stacked 5ths in each hand but now instead of playing the b3, b7 & 11 in the right hand, we are playing the major 3rd, major 7th and sharp 11th . Remember that in major keys, we raise the 11th as the natural 11th is an ‘avoid note’ due to the half step interval between the major 3rd and the natural 11th. Look out for major chords with the sharp 11th in the melody to utilise this major sharp 11 voicing. Practice both the major and minor variations of this voicing... they are both very useful. Remember to memorise the scale degree formulas for all voicings that you learn. 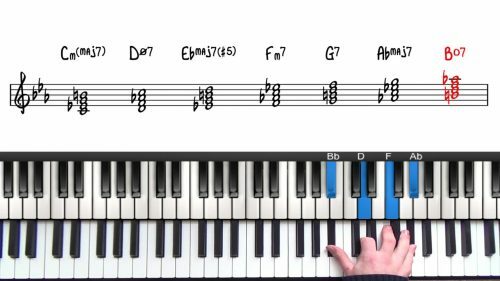 Then analyse the scale degree of the melody note whenever you are playing jazz standards.